The last book I read!! This book was amazing I loved every word I read. I think it's partly because I have a big interest in this type of thing also when we were on about dream jobs he literally has the job I want!! 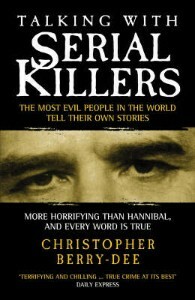 Christopher has many other books along the same lines (I'm working my way through them). His books help me with my degree as he is also a psychologist so some things he writes helps me with my assignments. I would strongly recommend this book/author if you have an interest in prison life or murders etc. I actually came across his book by accident but I'm glad I did as I have read two of his books and I enjoyed both. It really surprises me how much the criminals share with him. Do you have any book suggestions for me?